This past week the Alta Editions crew had the privilege of sharing our first digital cookbook with colleagues from our corporate headquarters in Berlin, Germany. 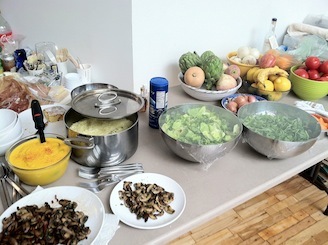 Over 30 employees turned out to cook a selection of recipes from the Laurent Gras: My Provence eBook. 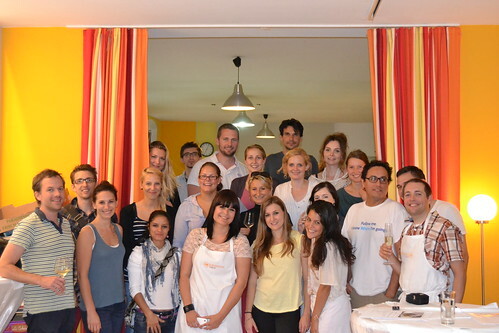 The event was held at the colorful Kulinarischer Salon in the beautiful Charlottenburg neighborhood of West Berlin. Planning this event from New York was no simple task. 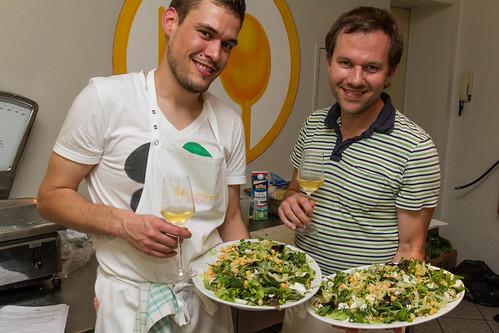 The number of Berlin cooking salons was about as limited as my German language skills and my original plan to cook twenty-five dishes was quickly cut down to sixteen. Thankfully with help from our German communications department, we were able to divide the employees into teams and translate all of the ingredients for the wonderful staff at Kulinarischer Salon to purchase at the local Kaiser grocery store. Questions about the implementation of some of chef Gras' more complicated techniques began to paint an ominous picture over my idea of what would be a wonderful, stress-free event. 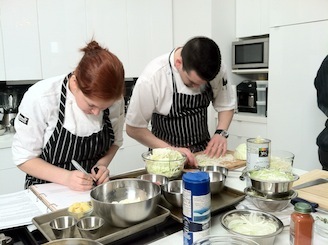 Luckily after a few successful salad preparations and some glasses of French wine even the most cooking-challenged members of our staff were making culinary magic! For six hours the kitchen was filled with wonderful aromas and abuzz with the sounds of knives chopping, pans frying and nonstop laughing. By the end of the evening every group completed their assigned dishes with the only two mishaps being a spilled Chocolate Tart and an over salted Crabe Toulonnaise. The event turned out to be a great success not only for team building but also for providing us with delicious food to enjoy together. Cooking with Parchment Paper "En Papillote"
Cooking with parchment paper, or “en papillote,” as it is referred to in our Laurent Gras: My Provence is the classic technique of baking ingredients in parchment pouches to lock-in flavor and create delicious, naturally low-fat meals. The technique is used in cultures all over the world and doesn’t always involve parchment paper. In Asia, the South Pacific and the Americas cornhusks, banana leaves and water lotus work equally well to steam traditional dishes from meat and fish to vegetables and rice. No matter the wrapper, this easy to use technique always creates an enjoyable spectacle at the table. As the package is cut, steam is released in an aromatic plume revealing the beautiful and moist preparation inside. Experimenting with ingredients is limitless with the "en papillote" technique as long as there is a bit of liquid to create the steam. Thinly cut pieces of meat, fish, shellfish or vegetables work best but it’s important to include aromatic ingredients such as ginger, white wine, meat stock, herbs, or garlic to flavor your main ingredient since steaming (although healthy), can often leave foods tasting bland. In this video for a Pork Chop En Papilliote, chef Laurent Gras demonstrates how to use parchment to cook a thicker-cut of meat. Although not using a traditional parchment pouch or the usual leaner meat such as fish or chicken the result is the same: a steaming flavorful meal that is low in fat and high in taste. Photo © 2012 Shimon and Tammar Photography. If you're like most Americans, you're probably used to buying prepared fish fillets, which saves time and makes recipes a lot easier to prep and cook. On the other hand, buying a whole fish often means getting a fresher fish. The technique for filleting a whole fish requires precision, patience and a very sharp knife. Without proper technique, fillets can come out misshapen and full of bones. In this video from our latest digital cookbook, chef Laurent Gras demonstrates his method for making snapper fillets along with some helpful tips for determining freshness and quality when buying your fish. Cooking with foam is a technique that was widely used in fine dining in the 1990's and is still used in a surprising number of professional kitchens today. While foam in restaurant cuisine may be met with mixed reactions now this simple technique can inject a healthy dose of fun and creativity into your home cooking. The use of foam in cooking was pioneered by renowned chef Ferrán Adriá, who first served "espumas" (Spanish for "foam") at his legendary restaurant El Bulli in Spain. 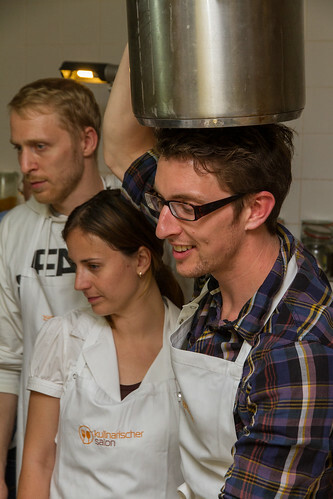 The technique has been documented in detail by Adriá and others, but has never been widely adopted in home cooking. That's too bad because all that's required to get started is a N2O canister, or "food whipper," and a little imagination. In Laurent Gras: My Provence, Chef Gras demonstrates how easy it is to put this simple technique to work. He adds a touch of elegance to his Asparagus Salad with Comté Emulsion recipe with the use of an iSi canister. According to Chef Gras, the secret behind successfully using a canister is, “the balance between protein and fat inside the liquid”. In the following video Gras shows how to make his Comté cheese emulsion using only cheese, cream and gelatin. We found it delicious on asparagus, but its light and airy texture would provide an excellent complement any number of vegetable dishes. Chef Gras's asparagus salad recipe isn't the only example of how to use an iSi canister in your home cooking. Find out how to make super light and creamy potatoes in his recipe for Olive Oil Poached Cod . Looking to get started? Amazon has a range of iSi canisters available. And if you're looking for other creative ideas for cooking with foam, check out our "Cooking With Foam" Pinterest board for some great tips and recipes to use with your N20 canister. Ever wonder how a cookbook is created? Here's a behind the scenes look at the photo shoot for Laurent Gras: My Provence, shot over a two-week period in a TriBeca-based culinary photo studio aptly named The Shooting Kitchen. We had the pleasure of working with an amazing team of talented professionals including the dynamic photography team of Shimon and Tammar Rothstein, co-author and James Beard Foundation EVP Mitchell Davis, the film crew from Broderville Pictures and finally, master chef Laurent Gras and his two assistants Marco and Amanda. On the other hand, working on a cookbook with a master chef does have its perks. Aside from picking up the occasional cooking tip and working in a studio constantly filled with mouthwatering aromas you get to taste EVERYTHING! This cookbook shoot was an absolutely amazing experience. Being in the studio with a master chef and seeing first hand how he carefully prepares each dish was truly an inspiration. Chef Gras worked with such precision and skill that each dish came out perfect, allowing Shimon and Tammar to exercise their acute senses in capturing the essence and beauty of each dish. Although the two weeks flew by we will always have the amazing photography to remember it by. We hope you enjoy the photos and videos in Laurent Gras: My Provence e-book as much as we loved making them!